It is no secret that the holiday season is my most favorite time of the year. For me it really starts in the fall all the way to the beginning of the New Year. San Francisco is extra cozy and festive around Christmas time. This City By The Bay is mine and BFF's playground. 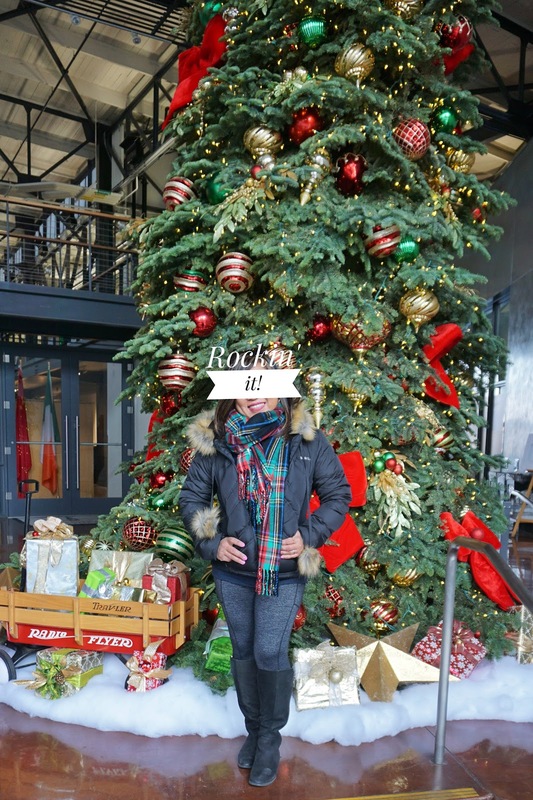 Rockin' it in my fur line hooded jacket from Bebe, scarf from J Crew, yoga pants from Athleta and my year old, trusty and comfy boots from Aldo's. Where the above picture was taken, this building is historic and free to go in. I discovered this hidden gem when I attended a holiday party here. It is just one of the piers along the Embarcadero but with breathtaking views of San Francisco. Alcatraz, the Bay Bridge and Coit Tower can be seen from a distance. If you are ever on your way to either direction going to Fisherman's Wharf or Ferry Building, you will pass by Pier 1 1/2. You might as well stop by for a photo op like what I did! San Francisco City Hall has so much history. Do you know that Marilyn Monroe and Joe Di Maggio got married here? The architectures, both interior and interior, are so beautiful that you will see many couples on any given day choosing this as their wedding venue. The City Hall gets decked out for the holidays. 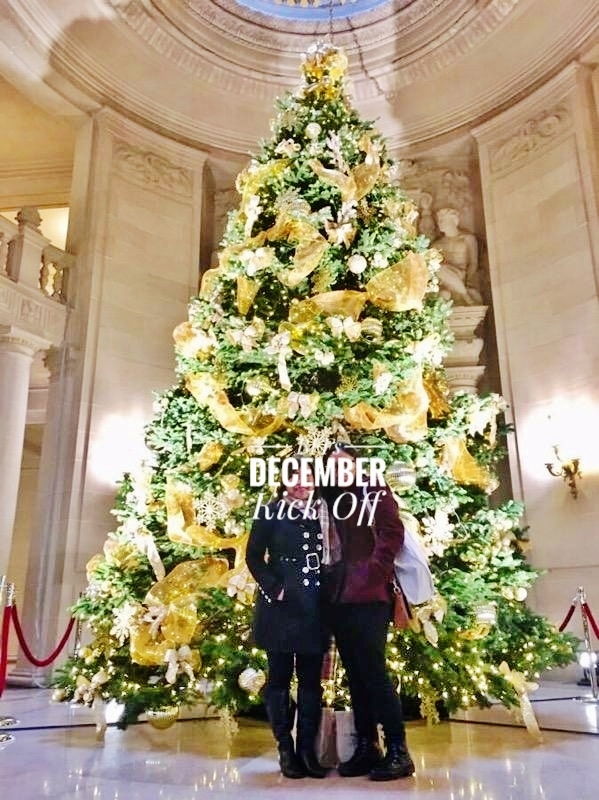 BFF and I kicked off the holidays here by attending a Christmas market and posing for a pic by the tree on top of the steps. A holiday visit to see the tree at City Hall is both a first for BFF and me as many times as we have walked by City Hall. Now we are adding a visit here to our holiday list. Whether you are a foodie or not, you have to visit the San Francisco Ferry Building. It first opened in 1898 as a transportation central for San Francisco. The modern day Ferry Building is a market place/farmers market that is a feast for the eyes and the palate. BFF and I come here year round. We spent a December afternoon drinking champagne and eating the iconic Acme sourdough bread, Cowgirl Creamery cheese and chutney. Then as always we walk around window shopping. And as always we had so much fun! The Christmas Tree at Union Square is the epitome of my Christmas in San Francisco. It is a Christmas pilgrimage for me to see it every year although is really just in my work's backyard. Located in the midst of department stores (Tiffany's, Macy's, Saks 5th, etc) with their glamorous window displays, it is the most festive (and really romantic!) 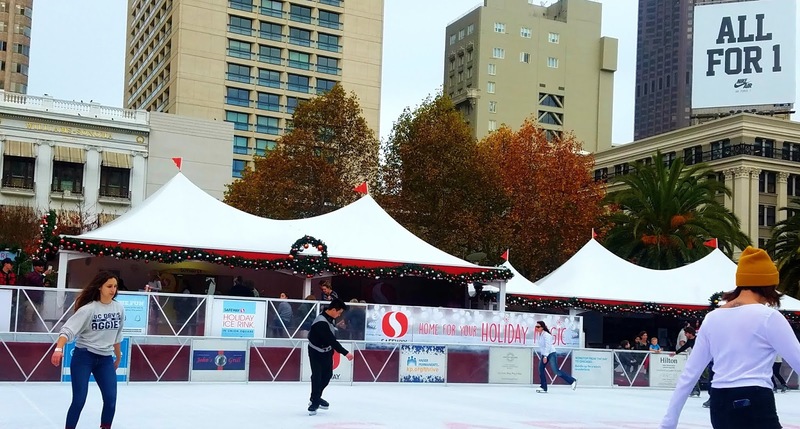 place in San Francisco to catch the holiday magic. The ice skating rink is a big plus if you skate but I prefer to just watch and cheer (quietly) for the skaters. 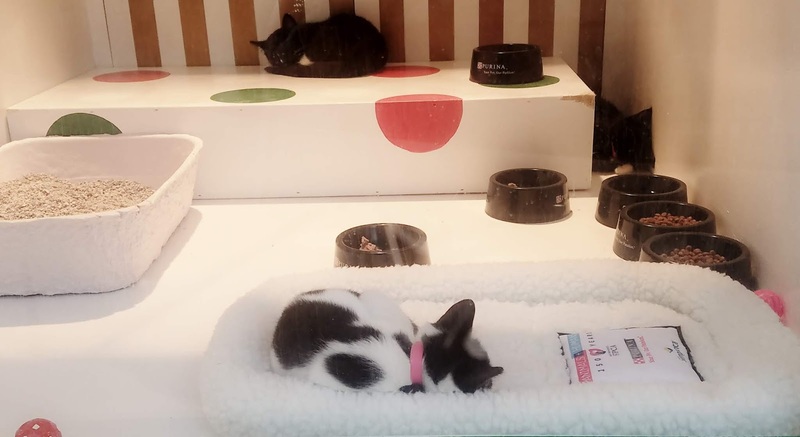 Every holiday is an opportunity to adopt kitties or doggies as they are the stars at Macy's holiday window. Or at least say "hello" and melt from such furry cuteness. This is a must-stop for me every December as it is right across from Crate and Barrel where I shop for my holiday decors. I often take a peek at these little guys, say a prayer that they find their forever homes soon and donate few dollars to San Francisco SPCA. This is where I sit for a spell to rest my tired legs as I walk all over downtown San Francisco to look at window displays. This is becoming a yearly tradition for me to make a stop here to sit, read and or just be quiet. 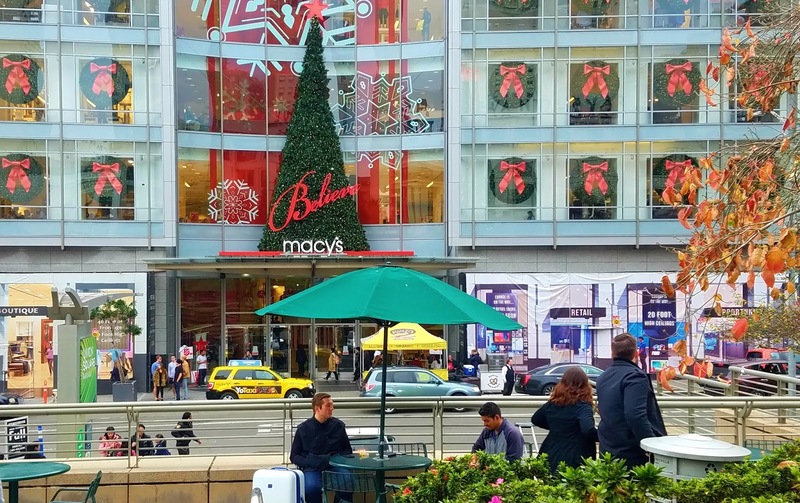 This year I was disappointed that there were no Christmas trees but this public private space is still very pretty. This was my last year's post about this place. Look at how pretty it was with the trees. 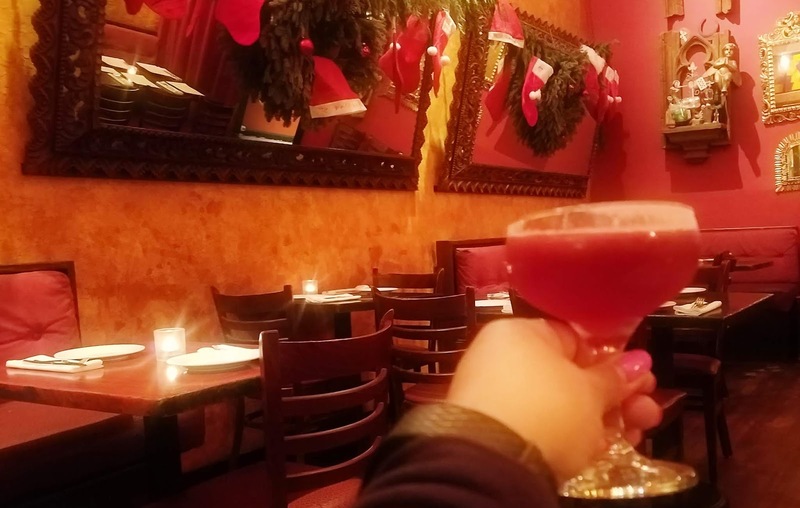 Every single year, for a decade, my gals and I choose a restaurant in San Francisco as where we laugh, eat, drink, reminisce and exchange presents. This year we had the most awesome evening at Destino, a Latin/Pisco bar. Christmas is also not complete without seeing my friends and sharing dinner with them before we say "goodbye" to the year, and look forward to new adventures in the new one. 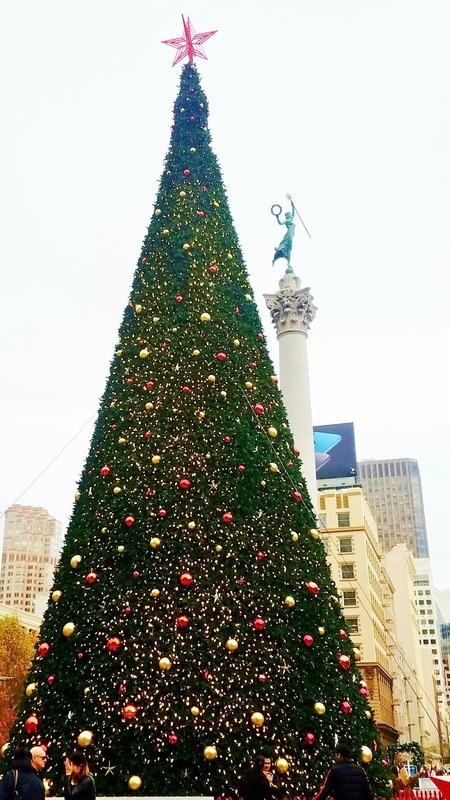 So, these are my personal Christmas traditions in San Francisco both old and new. There is comfort in old ways of celebrating Christmas and joy in finding new ones such as finding the Christmas ball sculptures. Visiting the Christmas Tree at City Hall was also a first for me and BFF. Sadly this year, we did not get to see a giant gingerbread house. However, BFF and I found a new tradition which was spending a magical afternoon of wine and cheese at the Ferry Building. We were supposed to see the gingerbread castle at Waterbar but it was closed due to a private event. This lead us to spend a chill afternoon at the Wine Bar at the Ferry Building. I like to call this Christmas serendipity. It warms my heart that I can post my personal journal of what makes me happy two days before Christmas. Until next Christmas where traditions will continue on........Do you have any holiday traditions in your city?